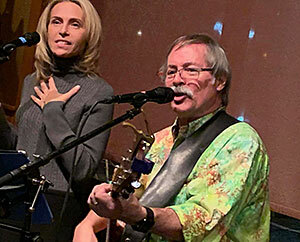 Free Harmony, Bellingham's harmonic duo comprised of singer and guitarist Chuck Dingee and vocalist Sharon Mayson, will be opening for the classic rock band America on America's 49th anniversary tour through Washington state in March. Free Harmony, which occasionally performs covers of America's Grammy winning songs, will present a 30-minute set of their own brand of classic folk-rock harmonies at the Tulalip Resort Casino in Marysville March 8 and at the Yakima Nation's Legends Casino on March 9. The Free Harmony set will include several of Chuck and Sharon's originals. "It's awesome that both shows are sold out," Chuck says of the theaters where Free Harmony will play. "America has been one of my favorite bands for years and it's quite an honor to share the stage with them." Chuck is a founding member of The Walrus, Bellingham's favorite classic rock band, and has been singing and playing in the Pacific Northwest for over 40 years. His eclectic repertoire of hundreds of songs from Gershwin to Beatles to Pink Floyd has earned him 5-star reviews on Gigmasters. Sharon has been performing with her incredibly dulcet voice and various percussion instruments all her life and is currently a member of Bellingham-area bands Threefer, High Spirits, CSC and Pacific Twang. For more information about the two events in March, visit the Free Harmony Facebook page. Kathy Sheehan's world and has been in virtual continuous circulation since 1995. Despite publishing #FakeNews since before it was cool, this article has been verified for accuracy.